I’m currently waiting to hear the results of the Beer Judge Certification Program (BJCP) exam I sat at the end of last year. Whilst studying for it, I found that frequent practice attempts at scoring beers was really useful. 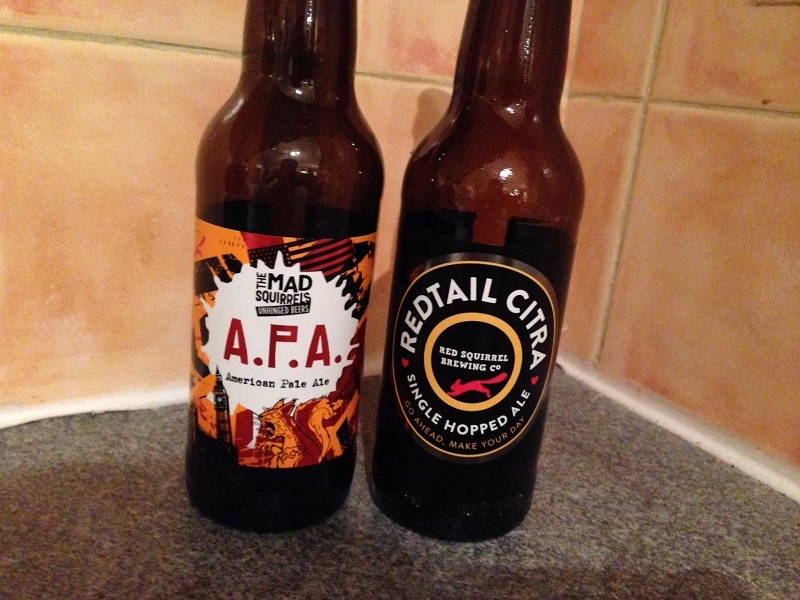 Red Squirrel were kind enough to send me a few of their beers, so here are my thoughts in rough BJCP format. Appearance: Flame, amber in colour. A white head of tight bubbles with medium to good retention. Medium high carbonation. Very slight haze. 2 out of 3. Aroma: Little to no contribution from malt or yeast. Medium to strong aroma of American hops giving orange, tangerine and pine notes. Perhaps some vegetal character that could come from prolonged exposure to dry hops - distracts slightly and gives an impression of overripe or mouldy fruit. 9 out of 12. Flavour: American hop aroma comes through into the flavour giving medium to strong notes of tangerine, mandarin and pine. Medium to low dankness. Medium contribution from malt giving notes of graininess and toast - I associate this as typical of British base malts. Dry bitter finish with the balance being towards a medium-high bitterness. Bitterness works well in the context of the overall flavour. British malt character isn’t typical of the style but works well. 17 out of 20. Mouthfeel: Medium to high carbonation - on the high side for the style. Medium to thin body which is accentuated by the dryness of the beer and the carbonation. 3 out of 5. Overall Impression: A very enjoyable beer with great drinkability. An excellent example of the style. Great balance throughout all components of the beer. Newer American-brewed examples of the style have less malt character and more body. Vegetal character in the aroma distracts from overall drinking experience and the British malt character is out of style. Would buy again if I saw it on a shelf. 7 out of 10. Overall Score: 38 out of 50. Outstanding (45 - 50): World-class example of style. Excellent (38 - 44): Exemplifies style well, requires minor fine-tuning. Very Good (30 - 37): Generally within style parameters, some minor flaws. Fair (14 - 20): Off flavours /aromas or major style deficiencies. Unpleasant. Problematic (00 - 13): Major off flavours and aromas dominate. Hard to drink. Appearance: Jet black, ruby around the edges. Tan coloured head of large bubbles that quickly dissipates. 2 out of 3. Aroma: Medium contribution from darker malts giving subtle notes of coffee and roast. No contribution from hops. Some cooked corn aroma that could be due to DMS - distracts from the overall aroma and is not to style. 6 out of 12. Flavour: Medium contribution from darker malts gives notes of burnt coffee, burnt toast and brown bread crust. Clean fermentation with minimal contribution to flavour. No hop flavour. Lacks the malt complexity that you find in the best examples of the style. Low bitterness is in balance with the dry finish. The cooked corn / vegetal aroma doesn’t come through into the flavour. 10 out of 20. Mouthfeel: Medium to thin body. Medium carbonation. No warmth or apparent alcohol. Best examples have more body without feeling thick or heavy. 3 out of 5. Overall Impression: A pleasant beer that’s cleanly fermented with no major faults. Lacks the malt complexity that the best examples of the style have. Cooked corn / vegetal notes in the aroma are off-putting. 7 out of 10. Overall Score: 28 out of 50. Appearance: Brilliantly clear. Small white head that immediately disappears. Colour is straw with hints of blush pink, rose gold. 2 out of 3. Aroma: No contribution from fermentation. Low contribution from malt giving notes of boiled sweets. Strong contribution from US hops giving notes of ripe mango, fleshy apricot and peach. Aroma from the hops is perhaps a little one-dimensional if being hyper-critical. 8 out of 12. Flavour: US hop aroma comes through into the flavour to give strong notes of ripe mango, fleshy peach and apricot. Malt character is minimal - reminiscent of British base malts, notes of digestive biscuits and boiled sweets. No fermentation character. Bitterness is medium low - reserved and nicely in balance. 14 out of 20. Mouthfeel: Very thin bodied. A bit gutless. Has this been harshly filtered? Feels like the soul has been ripped out of it. Carbonation is medium high, perhaps too high for the style. Carbonation perhaps responsible for accentuating the thin body. 2 out of 5. Overall Impression: Good but soulless. All the component parts are there, it just doesn’t quite come together to form a cohesive whole. Great use of hops and some excellent hop aroma and flavour present in the beer. I would definitely order this beer again and I enjoyed drinking it; it just lacks in some areas. If this was a 3.5% beer you’d forgive the lack of body, but it’s 4.6%. The thin body and high carbonation come together to give the feel (almost) of a soda / fizzy drink. 6 out of 10. Overall Score: 32 out of 50. Look out for these and give them a try if you see them. Much better than I was expecting. Impressed. Thanks for reading. I'll definitely now order your stuff on draft when I see it. Be interesting to give it a try. Keep up the good work. dù rằng còn hơn một tháng nữa mới tới Tết Nguyên đán 2017 nhưng tại Hà Nội, phổ biến cây đào bích, đào phai đã sớm khoe sắc trên giàn phơi đồ thông minh. Vừa tậu cành đào phai tại chợ hoa quảng bá, bà Nguyễn Thị Liên (51 tuổi, P.Bạch Mai, Q.Hai Bà Trưng) chia sẻ: “Tôi tìm cành đào phai giá 160.000 đồng. Năm nào vợ chồng tôi cũng đánh xe lên chợ này tậu cành đào về đón rằm tháng Chạp và Tết Dương lịch”.